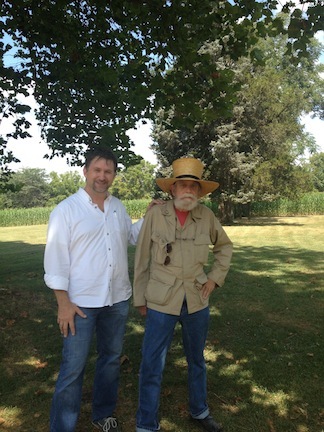 Last month, while giving a talk for the Friends of Wilderness Battlefield on Grant’s Last Battle, I had the chance to meet one of Ulysses S. Grant’s descendants: great-great grandson John Griffiths. The other child was Griffiths’s great-aunt, Julia Dent Grant, who later went on to marry into Russian nobility. As Princess Cantacuzène wrote a detailed account of her grandfather’s last days as part of her memoir, My Life Here and There. Young Julia’s brother, Ulysses III—John Griffiths’ grandfather—was three at the time the photo was taken. 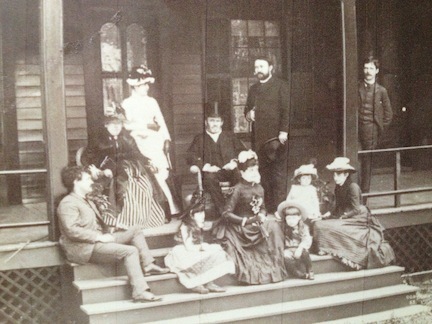 In 1949, Ulysses III returned to Grant Cottage as an adult to revisit the scene of his grandfather’s last days. John, beneath the wide brim of his tall sun hat and nearly buried under his own beard, had those same sorts of eyes: alive, expressive, intense. I often meet the descendants of soldiers who fought in the war, but not often do I meet the descendants of specific people I’ve written about. I’ve had a descendant of Stonewall Jackson hear me tell the tale of his last days, and now I’ve had a descendant of Grant hear me tell the tale of his last days. These are meaningful connections to me, linking my work back to the very real people who lived those poignant stories that I love to share so much. Grant (and Jackson) should not exist to us today as the marble men history sometimes remembers them as: they were fathers and grandfathers and great-grandfathers. And their family stories are still very much alive. Griffiths, who now lives near Fredericksburg, Virginia, was profiled by the local newspaper, the Free Lance-Star, back in 2009. This entry was posted in Books & Authors, Emerging Civil War Series, Leadership--Federal, Memory and tagged Friends of Wilderness Battlefield, Grant Cottage, Grant's Last Battle, John Griffiths, Ulysses S. Grant, Ulysses S. Grant III, wilderness. Bookmark the permalink. Thanks, Gene! I linked back to a story I wrote about that meeting. That was such a delightful evening and a real highlight of my Civil War career–not only because I meat Courty and her husband but because of the warm hospitality you and the NCCWRT showed me. What a great bunch of folks! Remarkable. Same size, same posture. Thank you so much for your feature of Grant’s g-g-grandson. I often wonder about descendants of the people I read so much about – where they are now, do they have any Civil War memorabilia, or recollections that have been passed down through the generations. I think this would be a wonderful topic for a future blog.